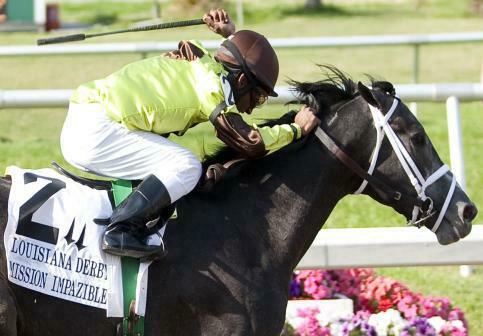 The “Impazible” dream came true for Twin Creeks Racing Stable, trainer Todd Pletcher and his assistant Michael Dilger when Mission Impazible proved clearly best by a length and a half in Saturday’s Grade II $400,000 New Orleans Handicap. A year ago Mission Impazible won the 2010 Louisiana Derby to register his signature victory of the season before being injured in the Kentucky Derby, but this year the future looms a lot brighter for the son of Unbridled’s Song based on the authoritative nature of his length and a half score. Pletcher completed the same Louisiana Derby-New Orleans Handicap double three seasons ago with Michael and Doreen Tabor’s Circular Quay, but Mission Impazible had finished second in the Grade III Mineshaft Handicap here Feb. 19 and appeared to have a tougher assignment in his quest for the year-to-year parlay. With his New Orleans Handicap score, Mission Impazible increased his career earnings to $798,854 with his third win in nine lifetime starts, ran the nine furlongs in 1:49.02 and returned mutuels of $5, $3.20 and $2.40. Adele Dilschneider’s Apart, winner of the Grade II Super Derby and Grade III Ack Ack Handicap last fall but third in the Mineshaft five weeks ago, ran a game runner-up race to withstand the late run of Virginia Tarra Trust’s favored Giant Oak by a head. That rival simply lacked the needed late response. Apart paid mutuels of $6.20 and $3.60 for the runner-up spot and Giant Oak returned $2.40 for the show position. Birdrun weakened to fifth after establishing early splits of 24.05 and 48.46.